Sam Jensen, Summer's Landing's most eligible bachelor and mayor, believed that it was his job to make all new arrivals feel welcome and fit into the community. So when Anastasia "Stacy" Monroe landed in town, Sam gave her the key to the city...as well as to his heart. But just what kind of nut had he fallen for...and to what lengths did he have to go to prove that he cared? 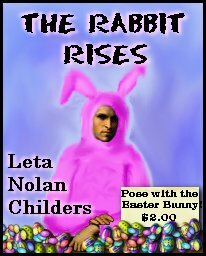 And why did it all hinge on his making a fool of himself in a pink bunny's costume? Stacy landed in Summer's Landing with her golden parachute severance pay intact and her heart in pieces. All she wanted was peace, quiet, solitude and the opportunity to follow her deepest desire to establish her own catering business. What she didn't want was some giant of a dark-eyed, dark-haired hunk falling all over himself to impress her. No thanks. She'd been there, done that, and posed as the poster child for that disease known as faithless men. Summer's Landing never had an Easter season quite like this one!